UNSEEN ENEMY is narrated by award-winning actor Jeffrey Wright and is written and directed by award-winning filmmaker Janet Tobias. CNN’s chief medical correspondent Sanjay Gupta, MD, is an executive producer and consultant for the film. Philanthropist Paul G. Allen, known for his catalytic leadership during the 2014 West Africa Ebola outbreak, is also an executive producer. Tobias embedded with some of the world’s top pathogen hunters and medical professionals for more than three years, crisscrossing the globe for UNSEEN ENEMY, to track outbreaks of Zika, Ebola, and influenza. From inside the hot zones in Brazil and Liberia, the film includes doctors who detail their heroic and often hazardous work from the front lines of the outbreak response. Doctors and researchers describe how they encountered the diseases, and how they are fighting the pathogens to save patients. While the headlines of deadly outbreaks are alarming, Tobias’ film makes the case that successful containment can be achieved with coordinated efforts of medical professionals, researchers, governments, communicators, and the public. Two historic examples support her case. World-renowned epidemiologist Dr. Larry Brilliant, guides viewers through his difficult decisions as he worked on the teams that forcibly vaccinated the last remote villagers against smallpox. Others describe how the global spread of HIV/AIDS could have been stopped if governments and public health bodies had acted more deliberately to warn the public. Dr. Brilliant warns now that there may be 30 emerging human pathogens that have the potential to become epidemics. “The public plays an essential role in the fight to contain and eradicate diseases like Ebola, Zika, and influenza,” said Dr. Gupta, about his engagement in producing UNSEEN ENEMY. “It’s always been my goal to bring the best scientific and medical information to viewers so they can make informed decisions that improve their health. The situation is urgent, but information can help make us less vulnerable,” he said. 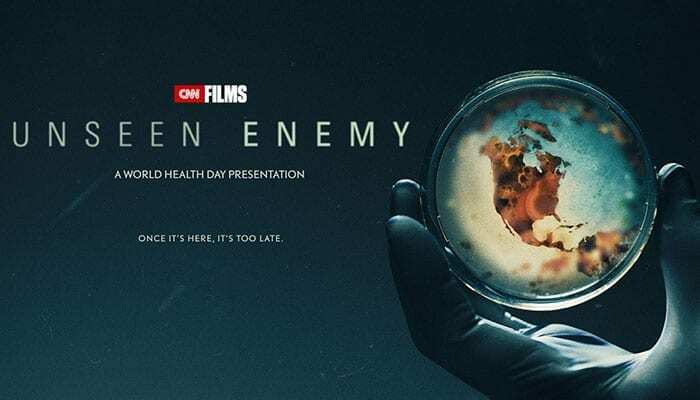 In addition to the premiere broadcasts on World Health Day, UNSEEN ENEMY will encore Saturday, April 15 at 9:00pm and Sunday, April 16 at 2:00am Eastern, with a short, CNN-produced companion special. The special will feature CNN’s Dr. Sanjay Gupta and Anderson Cooper with a discussion on the existing vulnerabilities to disease outbreaks and the tools needed to close the gaps in disease response. Gwen and Terry Zwanziger, parents of a teen who died of flu complications, now urge other parents to become informed about preventive vaccines and advocate for more money for flu research. In addition to the telecasts on CNN, Unseen Enemy will also stream live for subscribers via CNNgo on Friday, April 7 (www.CNN.com/go and via CNNgo apps for AppleTV, Roku, Amazon Fire, and iPad). The film will be available the day after the premiere (Saturday, April 8) via CNNgo. For additional information about the film and other ways to watch it, please visit: www.takesallofus.com.